Good. Native English bluebells (Hyacinthoides non-scripta) are hardy to -20F (-30C). Topdress with a balanced organic fertilizer in spring, when new growth appears. Daylily. 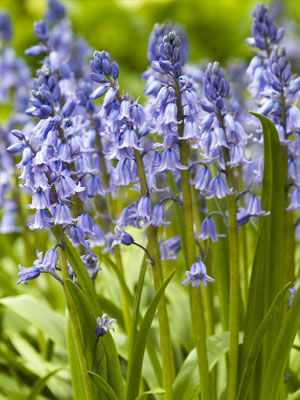 Ferns and primroses make lovely neighbors, but bluebells are often planted in large swaths for a natural look. Set out dormant bulbs in the fall, planting them 4 inches (10 cm) deep. Set out container-grown plants in spring. Plant in large groups. Bluebells naturalize with a little encouragement. They are especially well suited to growing near beech trees. All plant parts are poisonous to pets and people.